A few months ago, several Catholic organisations met together in Quito, Ecuador, to take part in a project as ambitious as it is authentic and necessary: the creation of a school for the promotion, protection and enforceability of human rights in Amazonia. Now that I’m physically here, in the heart of the Ecuadorian Amazon, I’m happy that this project has become a reality and I’m proud to be part of it. Extending across nine countries (Bolivia, Brazil, Colombia, Ecuador, Guyana, French Guyana, Peru, Surinam and Venezuela) the Amazon is a biome that plays a vital role for the planet as a climatic stabiliser, keeping the air humid and producing one third of the rains that water the Earth. It is also an immense inhabited territory that is home to around 3 million indigenous people, including 390 peoples and nationalities, in which 240 different languages are spoken. With the discovery of its natural resources, Amazon has been identified as a strategic reserve for the economic interests of many countries. This “sanctuary” of bio- and socio-diversity has been greedily exploited, to the extent that today more than 20% of its vegetation cover has disappeared, the effects of climate are being felt, and those most affected are populations living in a state of poverty and vulnerability. Following a long history of commitment and accompaniment by Church organisations, the appeal Pope Francis launched in his Encyclical Letter Laudato Si’ to defend Amazonia, one of the planet’s lungs and of vital importance for the future of humanity, has been taken up. The Pope highlighted the role of civil society organisations, which accompany populations in lobbying governments to fulfil their duty to conserve the environment, without giving in to commercial interests (LS, 38). 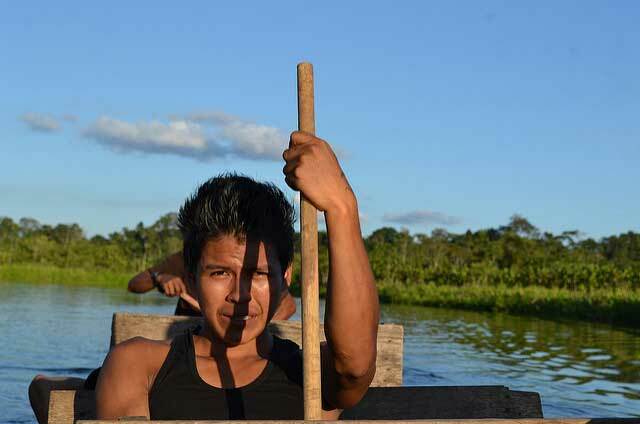 Despite this commitment, the rights of Amazon populations to life, health, enjoyment of their own land and self-determination are increasingly being violated: frequent isolation from public decision-making processes regarding the construction of large infrastructures; persecution of many protectionists; and loss of the cultural identities of many indigenous peoples are emblematic examples of this situation. In this context, local actors often lack adequate information and accompaniment relating to human rights protection. The Pan-Amazonian Ecclesial Network (REPAM) aims to create a training programme for community leaders and pastoral workers in the Amazon region, who have an extensive track record in protection and may thus respond to the challenges highlighted by the Pope. The school has five modules, which investigate the themes of local identity, collective rights, international human rights protection systems, case methodology and documentation, and finally advocacy. The participants have been selected on the basis of experience in defending cases of serious violation of the rights of people and the environment. They should also have strong local roots, commitment to the Church and its communities, and be able to take on the responsibility of replicating what they have learnt at the school in their local milieu. So 25 participants were chosen from five Amazon countries – Bolivia, Brazil, Colombia, Ecuador and Peru – who made a great effort to dedicate five weeks to this capacity building process. Each territory brought along its history, frequently of suffering and struggle, but everyone joined together in the common causes of love for justice, for rights and their people’s identity, and care for Mother Earth, our common home. As part of REPAM, Caritas Internationalis contributed the module on international human rights protection. The main challenge was to transform the legal concepts and technical terminology of this subject into simple language that is close to and useful for communities. On the one hand, the participants received valuable teaching from a group of top experts, and on the other, they taught us a great lesson on the worldview of the Amazon’s indigenous peoples and farmers, based on the transcendence of our relationship with Mother Earth and the conditions in which we leave it for future generations. We were left with a strong impression by a representative of the Yanomami people, who told us that in his culture and way of life the conflicts that afflict the Amazon and the world are unthinkable. On returning to his community, his dilemma is how to explain to his people, and especially to his children, the causes of these conflicts and threats indigenous people are facing without being part of them.